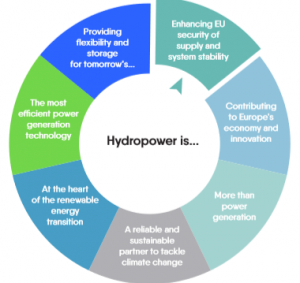 Hydropower plays a major role in meeting Europe’s ambitious energy transition goals. In particular, it complements the increasing share of variable renewables in the European power system. Such a system, with large deployments of wind and solar, requires sufficient flexibility, firm capacity and the ability to balance variable generation. Hydropower has all these capabilities. Hydropower not only fosters EU energy independence and enables the integration of large volumes of variable renewable energy, but what is more important – has an exceptionally high level of guaranteed capacity and is crucial for system stability and security of supply. You can find further information for the most reliable and sustainable partner to tackle climate change, in the Hydropower Fact sheet, prepared by EUROELECTRIC.